This is my very first sewing experience and my first personal blog experiment. Two days ago I completed my first homemade dress and I’m so proud of having managed to bring the project to an end. Some months ago, I don’t even remember how, I came across a fabric website (www.supercut.it) and I fell in love with the graphics of the fabrics. I thought right away that it would be nice knowing how to sew in order to create some dresses with those fabrics. So the idea of learning to sew popped into my head. Months went by and this idea kept swirling around in my head. One day in May, I decided to go with my boyfriend’s mom to a fabric store and there I bought my first cloth (that I haven’t used yet). Fiorella also gave me some useful suggestions to shorten a dress closed in my wardrobe for years. I had my mother lend me her sewing machine and after she explained me how to turn it on and how to make the basic stitches, I managed to shorten my dress. I even made my first gathering. Even though it had been a really little work, ending it up alone gave me a great satisfaction. Then I tried to buy two Italian sewing books to understand how to make a dress, but they turned out to be too complicated for an absolute beginner like me. So later I got into the net and a whole new world of possibilities opened up for me: blogs, forums, videos, thousands of tutorials… Again on Supercut’s website I came across Paunnet blog (www.paunnet.com) where I got tons of useful info, for instance the link www.urbancut.de where I bought my first pattern: Peony – Colette Patterns. Later I find out the Colette Patterns blog (www.coletterie.com) and bought The Colette Sewing Handbook by Sarai Mitnick. The book and the blog were really useful to understand which basic tools were necessary and how to get my project started. I also bought some clothes on Supercut.it, among which this Dsquared2 printed fabric that I’ve loved since the very first time. 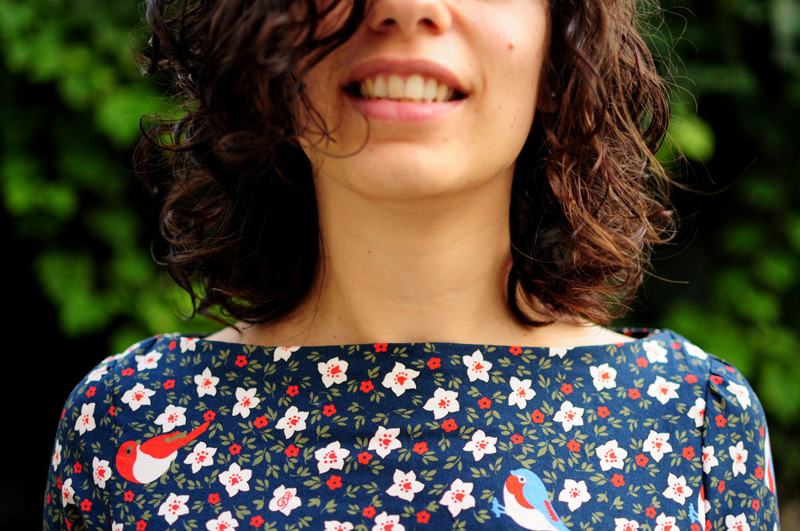 Thanks to the precious suggestions of Paola and Lella, from the haberdasher shop close to my place, and Sara, from the sewing machine shop in Milan, I managed to understand how to cut and sew my dress item by item. Finally I bought my second English book, Love at First Stitch by Tilly Walnes (www.tillyandthebuttons.com) that I’ve found really useful for true beginners like me… It explains sewing step by step, from how to turn on a machine to how to make a dress, going through intermediate steps. After reading and soaking (almost) everything up, the time had come to put theory into practice! I plucked up courage and got started. Taken the basic measurements (bust, waist and hip), I chose the size on the pattern. I found out right away a little problem: my measurements don’t match with one single size (size 4 for bust and 2 for waist and hip). Since it was my first attempt I decided to cut the larger size (4) and make a test version with an old sheet in order to understand how it would fit my body. It’s better losing some more time than making a mess and having to throw everything away. Moreover I could practice some cutting and sewing before the final version. 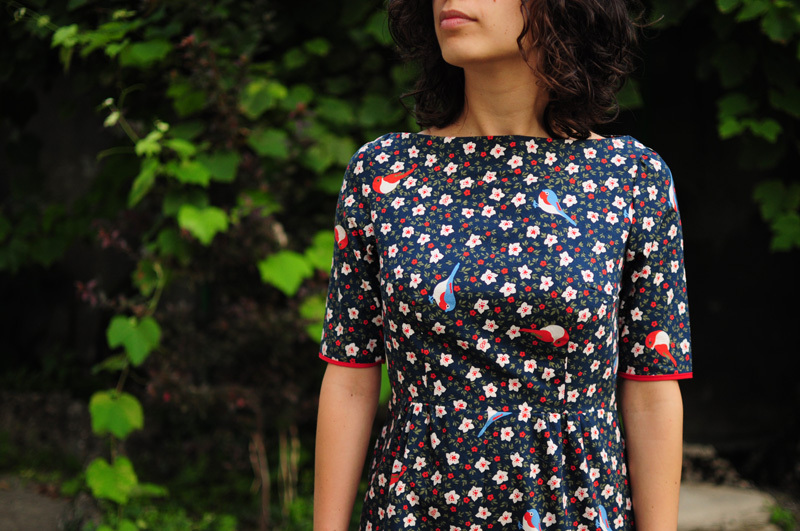 I quickly sewed the dress and I liked the test version straight away. However, there was too much fabric on the waist. I adjusted the pattern transforming the lower part of the bodice and the skirt into size 2. I also shortened the sleeves by 19 cm so they finish just above the elbow. And then I cut the fabric with a rotary cutter on the cutting mat. I tacked the bodice and I started to sew. I was suggested to use Overlock stitch instead of zigzag to finish off the raw edges similarly to the overlocking machine and to avoid the double seam (straight and zigzag). Unfortunately, being in a hurry to realise my first seam and being very tired (it was past midnight! ), I probably didn’t set the right width and length of the stitch and I created a little disaster. Patiently, the next time, I studied the instruction manual and I stitched the seam again. The result is not really nice on the bodice, but it would have taken me too much to unstitch everything. For the following seams I decided to have a straight seam plus an overlock seam to finish the raw edges off…as long as I won’t get more skilled it’s better to do it in this way. I had no problem at all with the red bias on the sleeves… It was simple, quick and satisfying! On the other hand I had some little problems in stitching the sleeves on the bodice…I found them a little difficult to sew. But I got by in the end! At the very end, when there were only the neckline, the invisible zip and the skirt hem left, and when I unfortunately lower my guard, the TRAGEDY! I realised that I had sewed a little skirt’s part in the overlook seam that joins the bodice and the skirt… and I had even already cut the raw edges. As a result, when I unsewed the skirt part off the overlook seam I saw a hole exactly in the middle of the dress, 2 cm below the seam. PANIC!!! The only thing I could do, trying to keep calm, was cutting the entire waist seam up, cutting further the skirt to remove the hole (other 3 cm, sigh!) and trying to reassemble the whole dress. I don’t know if this were the right way, but it was the only thing that came to mind. Fortunately the final result doesn’t look so tragic, even if the pockets are now higher than before and I have a little blue bird cut in the half of the seam, exactly in the middle of the dress. I also found difficult sewing the facing on the neckline … after that I see that I have a problem with curves! However, after reading well the pattern instruction and these two tutorials (http://www.coletterie.com/tutorials-tips-tricks/tutorial-understitching and http://www.tillyandthebuttons.com/2013/02/sewing-neckline-facing.html) I managed to top it off in a proper way. The only mistake I heedlessly made was not to press the shoulder seams open on both right and wrong sides but sew them together…in this way I’ve got too much thickness on the shoulders. But now I know how to make the next one! On the contrary, installing the invisible zipper was not so complicated as I had anticipated… following step by step this tutorial http://www.coletterie.com/tutorials-tips-tricks/tutorial-installing-an-invisible-zipper I managed to ride it out without so many difficulties! Et voilà…Finally here it is! After this first experience I can say that it’s doable sewing a dress by your own, without expecting the perfection that is obviously impossible, but patience (really loads of patience), curiosity and will are necessary. I took 2 months since I decided to create my dress to the final product, carving out time to study and practise every once in a while during evenings and nights. Internet and Youtube are very helpful, you can find a lot of tutorials and videos, like reading blogs and books as well. I found the books highlighted above especially useful for beginners (The Colette Sewing Handbook by Sarai Mitnick and Love at First Stitch by Tilly Walnes. Both include some really nice patterns). It was really useful also asking suggestions to whom is more skilled…take advantage of whom that already know how to sew or of shopkeepers, they will be very happy to give you some precious suggestions and info. In practise, to avoid errors, remember to try always the stitch before starting to sew, at least in the first works, and to make some attempts with the width and length of the stitch. Reading the sewing machine instruction manual and keep it always at hand is a must! And above all, do not ever lower your guard… the seemingly simpler things are the most tricky (see the hole in my skirt!!!). I will post mine soon, and maybe create a blog entry for it. Just like you, I decided after years of not sewing on a machine– but loving clothes, costumes, thrift and second-hand stores, and altering and mending slight things by hand — I would finally just jump in, get a machine, and try to teach myself to ‘sew for real’ with all the awesome tutorials and videos that are online. Thank you so much Goldie!! 🙂 Wow…I’ve passed your test with my first dress, I’m so proud! 🙂 It took me a lot of time and work but it was worth it and I’ve never stopped to sew since then. I’m pretty sure it’ll be the same for you 😉 And I’m sure your first project came out beautiful too. I found your blog whilst looking for reviews of this pattern, I think I am going to have to buy it! You did a great job of overcoming your mistake, well done- the zip is so neat too. What a lovely fabric! I’m planning to sew this sale dress so I appreciate all your explanations and tíos! Grazie! It turned out very well despite the mishaps. Learning to sew is definitely a process and I think we learn the most from our mistakes. But you managed to pull off a beautiful dress despite. That fabric is amazing! You’ve done such an amazing job on this dress esp since it’s your first sewn project! I’ve been sewing for years and I’d say your skills are far superior to mine! If this is the start for you then I can’t wait to see what you sew up now on in. Looking on Burdastyle just now, your dress caught my attention first, the fabric us just adorable;) great job! Thank you Tea! 🙂 I’m keeping on practising because I really love this my new passion!! And every time I find out new interesting things and practises. Hope to improve more and more! This dress is just… WOW 🙂 I’ve been occasionally trying to teach myself to sew for over a year and still have not made anything so complicated. I guess I need to take you for a model and just be braver. Thank you also for the blog…it is built with WordPress. I’d already used it for other websites in the past and I find it very simple in order to manage a blog or a website. che meraviglia! Ed è “solo” il tuo primo abito? Mi piace moltissimo la fantasia e il modello scelto, il taglio alto della vita e le comode tasche. Che altro dire se non che aspetto curiosa nuove creazioni? Grazie Marilisa! 🙂 A presto! Ciao, sono capitata sul tuo blog trovandoti su Blog Italiani di Cucito. Complimenti davvero, il vestito è stupendo: sembra incredibile sia uno dei tuoi primi lavori è preciso, curato in ogni dettaglio (adoro come hai rifinito il giro manica) insomma assolutamente perfetto. Capitando su supercut.it avevo adocchiato la stessa stoffa anch’io, poi però mi son buttata su una stampa a fiori blu su base bianca che non ho ancora usato (sigh). Sono curiosissima di vedere i tuoi altri lavori, sei davvero bravissima. Complimenti!